Karnataka BJP President admitted that the voice in audio clip released by HD Kumaraswamy was his own, but says it was edited according to convenience. 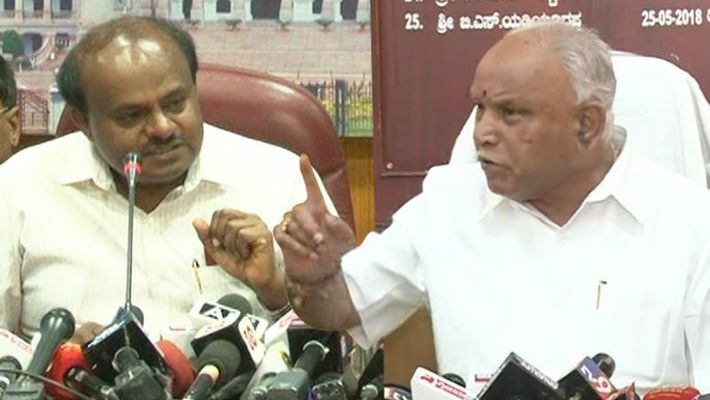 Bengaluru: BJP State President, BS Yeddyurappa has admitted that the voice in the audio clip that Chief Minister HD Kumaraswamy released was indeed his own but alleged that it was edited to convenience. Addressing the media at Hubbali airport, Yeddyurappa said that the he did meet JD(S) MLA Naganagouda's son Sharanagouda at the inspection bungalow in Devdurg. He claimed that the audio clip that was released was edited according to convenience. Yeddyurappa reiterated that if HD Kumaraswamy's allegations were true, he would be sure to retire from politics. Yeddyurappa's statements on the audio clip come just a few days after he had claimed the audio was fake and hadn't met anyone. However, the Bharatiya Janata Party have filed a complaint against HD Kumaraswamy in Vidhana Soudha for allegedly creating the fake audio clip with the motive of defaming the party. Hours before his budget speech on Friday, Feb 8, Karnataka Chief Minister HD Kumaraswamy had released an audio recording of an alleged conversation between BS Yeddyurappa and Sharanagouda Kandkur. The clip contained a conversation in which Yeddyurappa was allegedly trying to lure Sharanagouda Kandkur with money and a ministerial berth, in an attempt to dislodge the coalition. In the ten-minute clip, Yeddyurappa can be heard offering Sharanagouda crores of rupees in cash and a ministerial berth if he contested the bypoll on a BJP ticket. In addition to this, Shivanagouda Naik could also be heard saying that the speaker of the Assembly had been booked with Rs 50 crore to accept resignations of the ruling party MLAs without any trouble. BS Yeddyurappa, however, was quick to dismiss the allegations and called the chief minister a "cinema man who is capable of creating such clips with the help of voice overs." He had even said that neither he nor the BJP was interested in the dissidence within the coalition.